Party Zone: Easy Halloween Treats You Can Make in Minutes! Historically, I’ve been hesitant to tackle Halloween treats because the level of detail party treats usually have seems so daunting! Luckily, I stumbled on several easy ideas that I was thrilled to try out. Most of these can be made ahead. The ones that are more time-sensitive (like the fresh fruit) take minutes to assemble, so they can be done right before your guests arrive. They all flow together into a seamless little Halloween village of spooky characters. Yum! orange food coloring** I found some great natural food coloring packets in Whole Foods if you want your coloring to be natural. 1. Preheat the over to 350° and set aside two baking sheets lined with parchment paper. 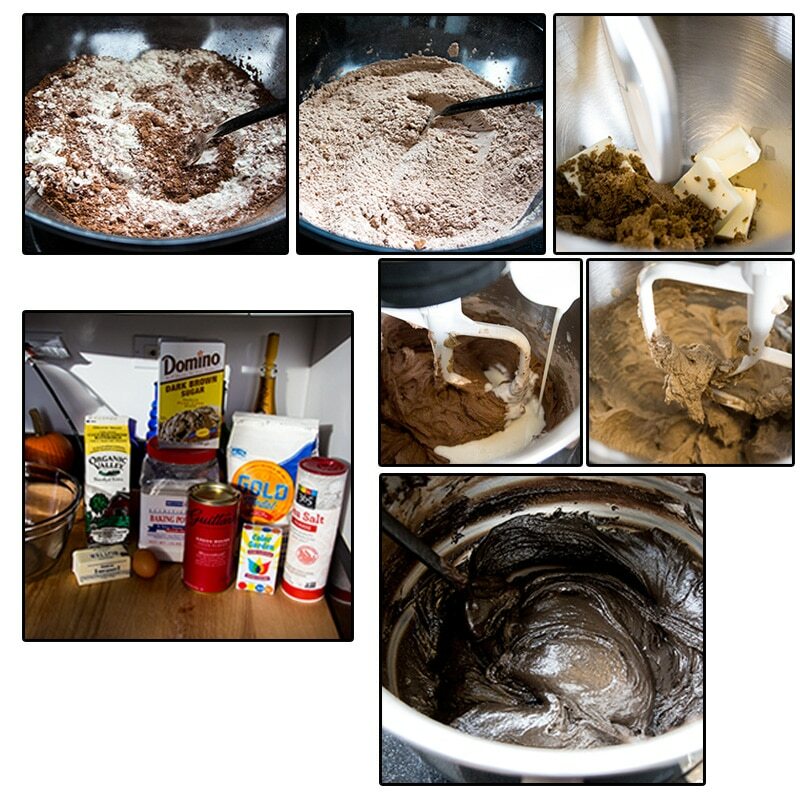 Whisk together the flour, cocoa powder, baking soda, baking powder and salt in a large bowl. In a mixer, beat together the butter and brown sugar until light and fluffy. Mix in the egg and vanilla. Add in the flour mixture and the buttermilk, alternating by adding a bit of each at a time and mixing. 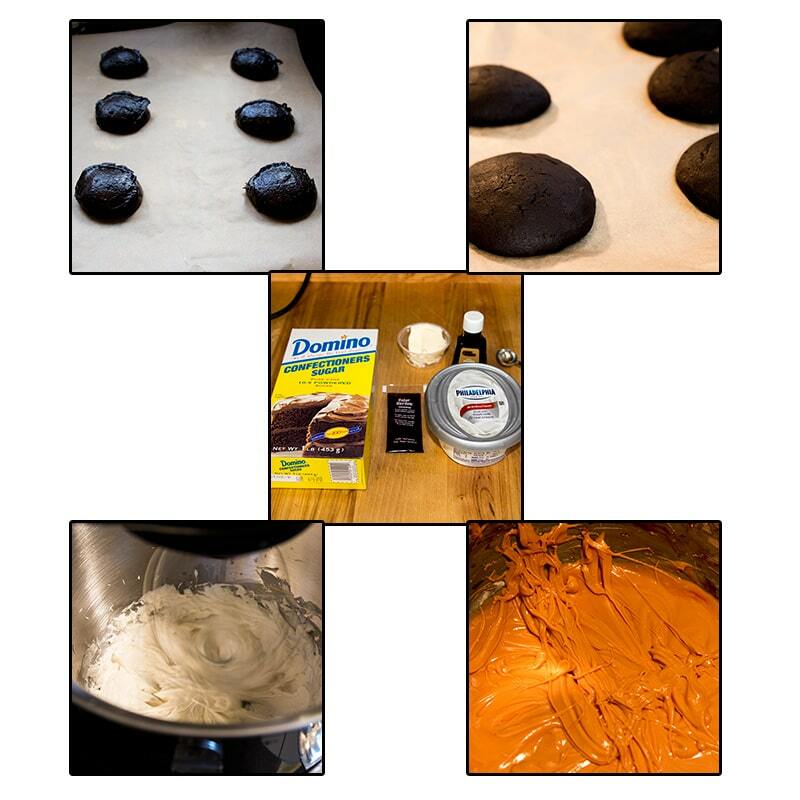 Add in the black food coloring drop by drop and mixing the batter until desired level of darkness. 2. Using an ice cream scoop (size depends on how large you want your pies to be), scoop out level mounds evenly spaced apart on the baking sheets. Place both baking sheets in the oven, on upper and lower rack, and bake for 16 minutes. Swap the baking sheet placed halfway through the baking process, placing the lower rack sheet on the top half and vice versa. Take out cookies when done and place aside to cool. 3. While the cookies are baking, beat the cream cheese and butter until light and fluffy. Add vanilla and the confectioners sugar by 1/2 cup-full while beating on low speed. Add orange color until the cream cheese filling is bright. 4. When cookies are cool, use enough filling to form a thick sandwich. Place two chocolate chips in filling to form eyes and store in fridge. Melt the butter and marshmallows over medium heat in a medium sized pan. 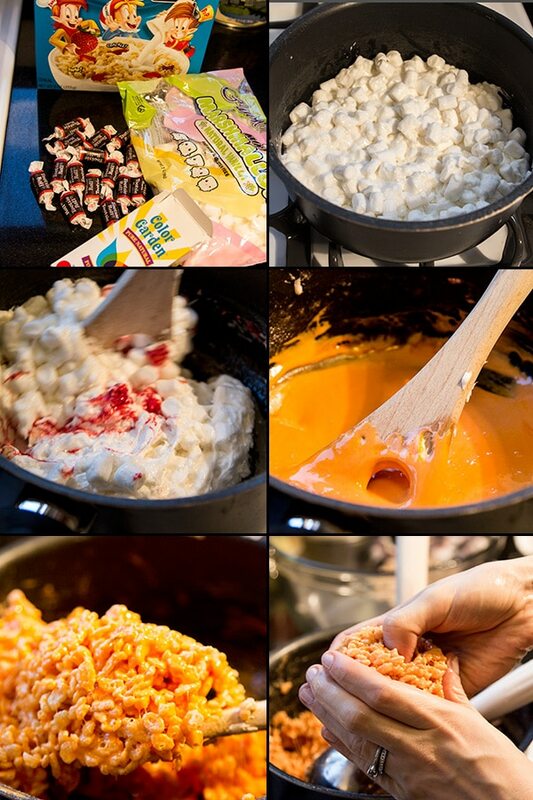 Stir in the food color and keep stirring marshmallow mixture until completely melted and smooth. Mix in the cereal. Almost immediately after the cereal is mixed in, wet your hands under cold water and scoop out mixture to start shaping into pumpkins. Use your thumb to make a well on top to place Tootsie Rolls into. You might have to re-wet your hands a few times while working through the mix. Most important thing is to work quickly! Once all the pumpkins are shaped, you might have to shape them and squeeze them together some more if the pumpkins are slightly fusing apart. Place the Tootsie Rolls into the thumb well on top and decorate with green icing if you’d like to make small leaves on top. Let cool and set completely. Scrub the apples well to remove as much wax as possible. The darker the apple’s skin, the darker the color gloss will be. Stick the twigs through the top of the apples, being careful not to completely poke them through. Heat the sugar, water and light corn syrup in a medium saucepan until it reaches 300 degrees. Watch the thermometer closely and turn off heat as soon as candy reaches 300 degrees. Add in a couple of drops of red food color and dip several apples in for red gloss. Afterwards, add several drops of black food color to make the color as dark as possible and dip the rest of the apples for the dark gloss. If candy is hardening while you’re still dipping, simply turn on heat to reheat the mixture again. For some healthy treats this Halloween, use fruit and assorted size chocolate chips! Cut bananas in half for ghosts and place 2 small chocolate chips for eyes and 1 large chocolate chip for mouth. Shape out a jagged hairline on a kiwi for a Frankenstein head. Use chocolate chips for eyes and a strip of a Tootsie Roll for the mouth. Make some white chocolate covered strawberries by melting white chocolate chips & placing dark chocolate chips for eyes and mouth. Get some clementines! Peel them and stick a small piece of celery on top to make healthy mini pumpkins.